In the winter of 2010, I traveled to Hawai’i with a school program, having never been before. During the time, I had no idea how this experience would impact my life. I now live here and consider it home. This place has shaped me profoundly, and I have discovered much not only about myself but also about us humans struggling to maintain our sense of place and identity in a globally charged world. Below is an essay I wrote upon my return to college in Washington after my short but profound time in Hawai’i. I like to return to it from time to time during transitions in my life as a reminder of where I have come from since then. In short, this is the purpose of telling stories; to remind us who we are, where we come from, and where we are heading. Hapu’u. Tree Fern. This was the name given to me. I liked the idea of being a tree fern, unraveling fronds towering over human heads, growing upwards steadily towards the canopy, towards light, the soft furry pulu shedding off of me, glistening a golden orange-brown through the crack of shade in this dense Ohia Lehua forest, with their bright red flowers shooting out like fireworks frozen in mid-burst. The canopy is full of sounds; a biophony. I am standing in the middle of a kipuka, this particular one is called Puaulu, a small patch of forest that stands isolated in the middle of an old frozen lava flow. It is an island of sorts, somehow untouched during the eruption that covered this side of Hawaii with molten smooth rock, pahoehoe, like syrup over pancakes. The ferns are a rusty color at the base, with a furry texture covering it. The rainforest consists mostly of these tree ferns. The Ohia Lehua trees form and enclose the canopy. Some of the trees release a hanging reddish-brown collection of aerial roots, a defense mechanism that is activated if the tree is somehow damaged. Ohia refers to the tree, lehua to the blossoms; bright red flowers, small buds, maturing into hard woody capsules. I take out my tiny sketchbook and make an attempt at drawing this giant fern. It is the first time I’ve seen one. They are everywhere, dominating the mid-canopy, shading, protecting. Today is full of first times. I am marveling at it all. The group is far ahead of me on the trail. I stop every step, noticing a new plant foreign and unfamiliar to me, beautiful to me. Everything is so different here. There are large cavities in the ground where the soil collapsed because of an absence of support beneath the old lava rock. The land here is not very stable. It is not so old as it is periodically covered with lava, as the island swells and grows, and erupts. My skin begins to breathe, sweating, opening up to the humidity. Rain falls softly and shyly. A pheasant comes bursting out of the brush and over my head, a great flash of blue and black. 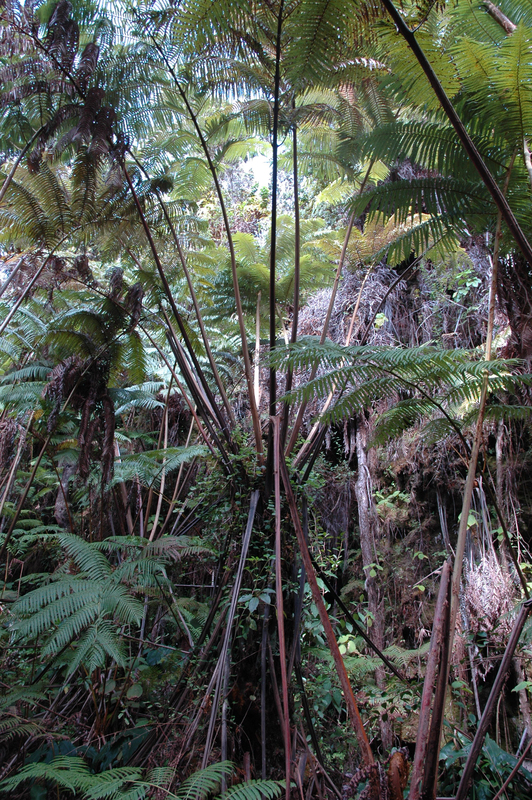 The size of the canopy and many birds residing in this Kipuka means that this forest is very old. I think about what it must have been like before the latest lava came barreling down out of one of the volcanic shafts that connects to the deep magma chamber. Hawaii is but 0.6 million years old, making it the newest land formation on the earth. In fact, some might say that it is still 0 years old since the land is actually still forming, fed by a hot spot deep in the mantle layer. Inevitably, someday, this kipuka will come crashing down, only to rise up again. Yesterday I landed by plane 2,390 miles from California; 3,850 miles from Japan; 4,900 miles from China; and 5,280 miles from the Philippines. I am standing in an island within an island, isolated by lava that is isolated by a great ocean. I take a deep breath in and look up at all the life existing in the canopy. I walk out to the edge of the Kipuka and the frozen lava flow. Standing between these two worlds I begin to contemplate the balances of life. All this life somehow made it to the most isolated place on the planet, all this life finding ways into every corner of the earth. I look down at my hands and examine the grooves sketched in my palm. I focus my eyes at the cracks in my skin. I wonder who I am. I wonder how life came to together to create me. Was I once just a mere bare rock that emerged from the ocean, born into the turbulent exposure of the world, growing and filling with life? It was the most pretty and mystical walk yet, with the sound of hundreds of birds chirping, the giant Acacia Koa and Ohia trees, some of which are joined together near the base of the trunk forming wild structures. The most mystical aspect of it all was the Ki plants that sprout up tall, then bloom long glossy leaves that are used in a variety of ceremonial ways. The ki plant was introduced by ancient Polynesians and is part of the lily family. It is considered sacred to the Hawaiian god Lono, and to the goddess of hula and the forest, Laka. It was used by the kahuna priests in their ceremonial rituals as protection to ward off evil spirits and to call in good. Hapu’u means ‘breath of the hill’. The young hapu’u grows upward until it is too heavy to support itself, at which point it cracks, splits, and falls over. New roots spring from the fallen trunk, and again it grows towards the sun. Again gravity pulls it back to the ground, and so on… this cycle continues, like long slow breathing. I came to Hawaii to reach out towards the sun, to feel alive, to get away from the confusion I faced daily back at home, and school. I arrived at the program silent and shy, raveled up like the new fronds of a fern, hidden from the other members of the program. As Americanized as this Island has become, Hawaii felt foreign to me, and very magical. I watched the sun rise above the Kilauea caldera. 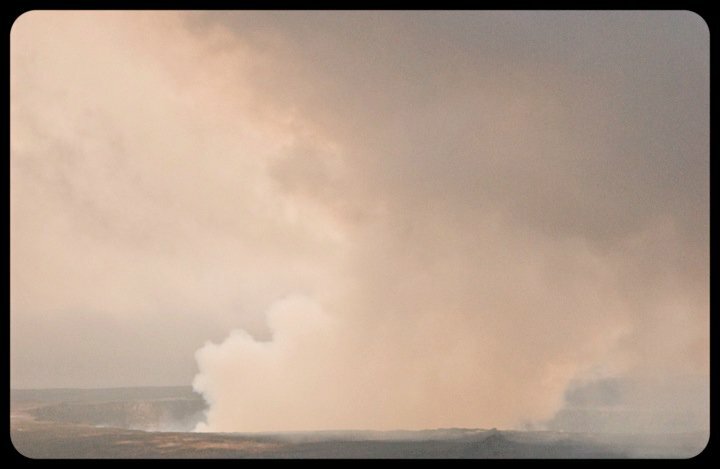 I watched it shine through geological vents, pouring vapor out along the bluffs, dissipating over the rim of the caldera that rises above the desolate crater floor. Within the caldera is the Halemaumau crater, home of the passionate goddess of fire, Pele, she-who-shapes-the-sacred-land, as her name is described in ancient Hawaiian chants. I am sitting perched at the site where Pele’s brother, Kamohoali’i, god of the shark, is meant to live. Pele gave him this cliff, Palikapuokamohoali’i, for helping Pele navigate to the island of Hawaii from Tahiti. It is said that she gifted him with this side of the caldera because no smoke or fumes ever blow in this direction. It was a beautiful sight, and is embedded in my mind. I picture myself as the shark god, looking down below into the crater where my sister Pele lives. I imagine the rain pouring down Mauna Loa, seeping into the ground, down towards the lava, towards Pele where her fiery passion vaporizes and steams through the cracked vents, bellowing out over my head, over the rim of the giant caldera, and fainting with the rising sun. I see myself as part of this story, the story of Hawai’i. I imagine myself as part of the land and wonder how I can feel so at home when I am thousands of miles away from all those I’ve ever known and ever loved. I did not want to return there. I wanted to be a part of this place, here, so active and alive with myth. I return down the slope from the rim of the caldera to our campsite. Everyone is just getting up, slowly emerging from their tents, standing, stretching – taking in the new day. There is a slight smell of sulfur dioxide in the air. Pele’s wavering temper lingers in my mind. I think about what the volcanologists we visited the other day who told us about the volcano’s continuously erupting activity – how they don’t know exactly what caused the inflating and deflating of the magma through the vents. There are only some possible theories conjured about the swelling and increased pressure in the magma chamber, but no one knows for sure. As the sulfur smell floods my nostrils, I smile with a wild yet comforting thought that it is, of course, Pele who is causing all of the eruptions. The ground began to even out. We were surrounded by tall grass, an ecosystem we had not yet been to, but beautiful nonetheless. The thick fields of grass made everything look golden, and their pink tops created a colorful scene, dancing through the light as the wind swooped through. Suddenly, I became overwhelmed. My eyes swelled up with tears as I closed their lids, feeling the wind push against my body, against all that surrounds me. At that moment, I felt very close to the land. I felt a part of it. I understand how we are born from the soil, and die into the soil. We all come from the same energy, Earth. It is very overpowering. I have been so calm and relaxed, so peaceful and balanced, so soft and real, comfortable and clean. But I do not understand how I felt at that moment amongst the grass. It felt like a great sadness pressing down on me. How I wish times were different. How I wish I could change the world. Sometimes I think I can feel it dying. I wonder how many of my tears cry for this. How many for happiness and beauty? How many for sadness? 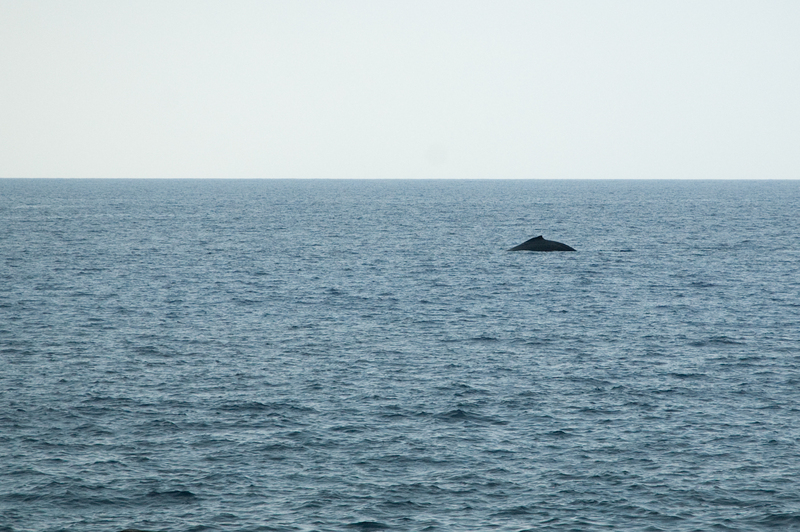 Just now I saw a whale emerge, startling me, as I looked out at the ocean. It was far away in the distance. I could only see debris shooting out of its blowhole. I focused on the Whale as it slipped beneath the blue, silently disappearing. The whale reminded me to stay focused on what’s left, and not to dwell in the absence of life, on the surface of how things appear. There is still an abundance, I just have to seek it out, believe in what’s left. We started out on an old frozen lava flow that stretches down the side of the biggest and newest formed island, the Big Island, comprised of five separate volcanoes, at least one still active and growing. The terrain gradually changes into thicker vegetation as we head laterally off the recent frozen lava and onto an older surface. The rock transforms from a dull charcoal color into a reddish-orange as it has had more time to oxidize in the exposed air. Many plants have made their home here, even without much fertile ground. We continue on across the frozen lava and into fields of long grass that lead us down rocky slopes eventually out to the ocean. The landscape is starting to change with our decent. The climate is fairly dry on the leeward side. Hills rise to the northwest of us, and to the south they fall down to the coast. We arrive at a lookout and can see for miles along the fall line. The beauty and expanse of the blue horizon envelops my peripherals, the water meeting the coast in deep, crashing waves. Things in the distant always look like they are moving in slow motion. To the east I can see the recent lava flow we traversed earlier slope down over a drop-off, then gradually traveling all the way to the coast and into the ocean. I stop to look out. As I graze across this landscape, something begins filling up inside of me, up to the brim of my eyes, ready to burst out. I feel compelled to be in solitude. The group stops for a break. 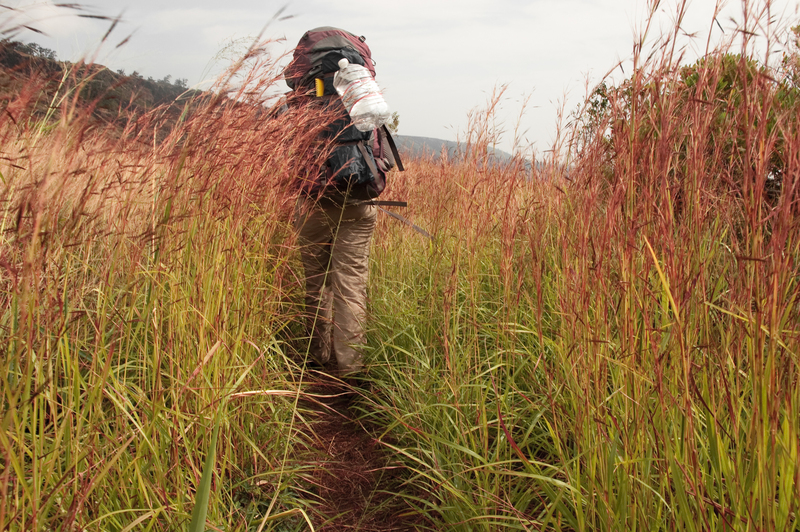 I unlatch my backpack’s buckles, put it down and head over the next hill, out of sight. I am tense; my breathing is fast, my skin is prickly. The corners of my mouth begin to tremble. I start to cry. I am lost and confused. This is my first backpacking trip. I sit down and hug my knees, allowing the tears to flow. I gaze up and scan the scenery around me, distorted with tears. I sense the calmness flowing around me. My breathing slows. There is a certain silence that exists here. I notice only the noise of wind darting across the sky and blowing through the grass, which rattles and sway together. I cannot even hear the rest of the group back at the trail, but I imagine them sitting there, munching on peanut butter-filled tortillas, laughing and breathing, taking in the warm air. I feel distant from them, disconnected. Why do I sit here away from the rest, alone? Why am I filled with emotions? What has gotten into me? I wipe the tears from my face, gather my wits and walk back to the group. Is it this place I have come to that is bringing about such challenging emotions, or is it where I come from? I feel like I am in a dream. I don’t know if it is because I went from a dark Seattle winter to a Hawaii warm-weather climate, or just being thrown into a completely different world altogether. Maybe it is because I am with all new faces. In a dream, I often feel unsettled. Nothing is ever quite right in a dream. This is how I feel now. But, I also feel good. I have been unusually calm since arriving. I have also been quiet, not too social. I wonder if this is just my shyness. I don’t seem to have anything to say. For now, I will just listen. The fronds of my Hapu’u begin unraveling as the sun climbs higher into the sky. My breath is deep and with each exhale I grow taller. I exhale so tremendously that the weight and height of my branches can no longer stand on their own. I fall, crashing to the ground. The waves breathe in again, and through the soft pulu of my Hapu’u stump, new fronds appear, coiled tight, starting the cycle all over again. This moment of solitude early in the morning is something I’ve never had before. It is a gift, and I cherish it each day. I either get up and run or find a spot to my calling and sit until I grow tired, returning to the group who are always there to greet me with that sort of calm energy that Hawai’i exudes. 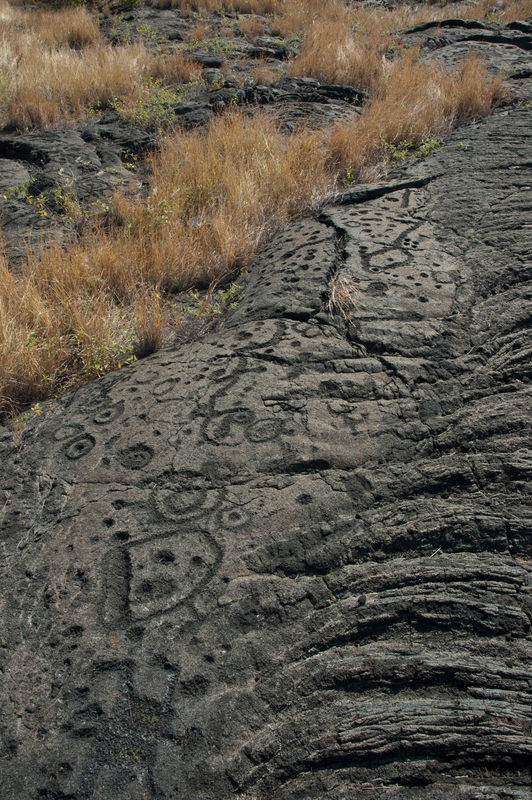 Our group went to see the ancient petroglyphs left behind by long lineages of Polynesians. We meander around the rocks on raised platforms, finding many ringed shapes carved into the frozen lava. Usually, a column or row of these rings can be found, all in a line, each about the same ratio between the inner and outer circle that make up the ring. The rings represent the belly-button, a symbol of birth, fertility, and family. Each line of belly-buttons is the lineage of a family and are unique in their carving, distinguished from one family to the next. Some stretch many generations back, and others continue to be added to this day, carving new rings for each new generation. The petroglyphs are located a great distance away from any ancient human settlement. It is a sacred place, a recording of existence, a story of humans rooted in the rock. Staring down at the donut-shaped carvings, I start to miss home, at least, the idea of home. I start to feel lonely. Where are my roots? Where do my people reside? How are we a part of the land, a part of this universe? I count the rings, one, two, three…ten…twenty…fifty…one hundred…they go on and on. I squeeze my eyes shut. I want to so badly carve my own belly-button into the rock. I want to be part of this lineage. I feel the hot sun bearing down on my exposed neck, making me sweat. I grow hot, unnerved. I want to yell out, scream at the world with such fiery passion, like Pele exploding out of the crater, erupting with volatile anger. I want to split into a million parts and float out with the wind and circle the globe until I settle into every corner of the world. All this life, in every corner of the earth. Where do I fit in? Mauna means mountain. Mauna Kea is the sacred mountain of Hawaii, the summit at an impressive 13,796 feet. Mauna Kea translates as White Mountain, also known as the mountain of Wakea. 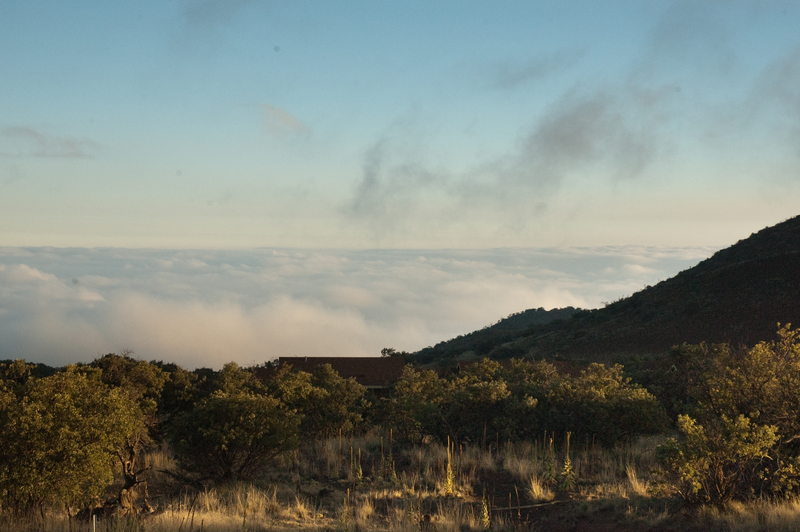 There is an ancient saying, Mauna Kea kuahiwi ku ha’o I ka maile, ‘the astonishing mountain that stands in the calm’. It comes from how the mountain’s summit rests above the cloud inversion line, and is one of the reasons it is such a good site for the science of astronomy, the other reason being it is surrounded on all sides by water, so there is virtually no light pollution. Mauna Kea is the tallest mountain in the world, measured from its base down at the ocean floor. It last erupted 4,500 years ago and is long dormant. We waited until the sun went down to view the awesome array of stars above. Every star seen with the naked eye is part of our galaxy, except for the Pleiades constellation, which consists of a cluster of stars from the Andromeda galaxy. The Hawaiians have their own name for Pleiades, Makali’I. I watched Jupiter set, and Mars rise. I watched one of the arms of our galaxy, the Milky Way, stretching across the entire sky in a wavy length containing an estimate of 1 trillion stars. There are so many that you cannot see them individually. The vegetation on Mauna Kea is extremely sparse, a characteristic of a montane desert climate. Dry air, windy weather, and variable temperatures make if difficult for plants to thrive and are why so few are found here. A now rare, but highly special plant of Mauna Kea, the endemic Silversword, glistens with so much silver it looks as if spray-painted. When cattle and sheep ran free, as they did in the early 1900’s, these plants were particularly tasty to them, and soon the plant became endangered. It was thought to have gone extinct until a few were discovered growing on the edge of a cliff, where no sheep or cattle could reach. The summit of Mauna Kea is an Alpine-Tundra climatic region, consisting of only moss, lichen, grass, and ferns. Very little fauna can be found. The only insect found to be living at the summit is the Wakiu, because of an anti-freeze chemical it produces. This highly specialized bug is a perfect example of species adaptation. The bug flies around finding dead frozen insects that were unlucky enough to be caught in winds sweeping them up to the frozen summit. The only native land mammal of the Hawaiian Islands is located up on Mauna Kea: The Hori bat. Other animals of flight in this area are the Nene goose, which has evolved to have shorter wings and lesser-webbed feet in order to better suit their new environment on the Island. Obviously, they do not migrate, but have been hybridizing with introduced species of goose. A full breed Nene is a rare sighting. The mountain itself is a sacred and holy place for the Polynesians, and only high priest have ventured to the peak, too sacred for any other class to be. The lake Wa’le on Mauna Kea is thought to have healing powers as is used often for medicinal purposes. Many believed the lake was bottomless because the water is able to collect instead of drain away through porous volcanic rock, but actually, the floor is made of clay. The lake is colored a solid green from the amount of algae growing in it. We travel up along the saddle in between the broad active volcano of Mauna Loa, and the steep dormant volcano of Mauna Kea. The van barely makes it up the road to the visitor center on Mauna Kea. We are ascending up towards a sacred place. After reading about all of the social, cultural, and political conflicts that still occur today concerning the volcano, I feel wary about approaching. Not only am I not a priest, but I also am not Hawaiian at all. This volcano is a site where very few people were allowed. Now it is littered with tourists and scientists alike, disturbing this holy peak. It does not seem right for me to hurl myself up the side of this mountain. I feel unwelcomed. The visitor center is only at 9,000 feet, the peak at nearly 14,000 feet. The van cannot make the rest of the climb, which I am somewhat grateful for. I already feel like a disturbance of some force or deity. The air is thin and cool. We are sitting at just about the inversion line, a layer of clouds suspended just below us. It feels like we are floating on top of them. If I strain my eyes just right, I can see the vast blue of the ocean, thousands of feet below. While we wait for nightfall, I spend my time meandering on nearby trails, observing the vegetation, what little of it there is. There is a small garden close by dedicated to restoring the Silversword plant populations, āhinahina,, a relative of the pineapple. Their silver color is an adaptation to their cold environment. The silver coloring are tiny shiny hairs covering the leaves, which are parabolic-shaped focusing the warm sun rays on to the plant’s growing point, raising the temperature of that point by 40 degrees. It is the same concept of a reflector or solar oven. Silverswords live for about 10 to 50 years as a low, round bush. At the end of their life, they send up a flowering stalk that can grow over 6 feet tall within a few weeks and produce up to 600 flower heads. It reminds me of the Great Pacific Octopus, which only lays eggs once, near death, thousands of them at once. She spends the last moments of her life guarding her eggs, keeping them hidden and safe. With a single death, comes a multitude of life. Looking around, I take in the emptiness of vegetation, the scattered life that exists on this barren mountain. It seems that I am not the only one unwelcomed, for there are few who have actually been able to colonize this harsh environment and make a life of their own. The miraculous ability to adapt; to not only survive in places with little to no nutrients, oxygen and violent exposures of the sun, wind and bitter coldness, but to thrive in this environment. I decide that I am not welcomed so long as I do not belong. Everything begins from somewhere else, and only those who find a way to survive and live in balance with their environment become a part of their environment. I stare back down at the Silversword and ponder what it means to be native. Where am I native to? What specialized adaptations have I evolved to have? If this mountain is thought to be sacred, are the plants and animals that live on it sacred as well? Perhaps there is some place where I will settle and become sacred myself. If you look down and focus on the ground where your stability lays, you can feel the whole earth shake and tremble, as it does, through age. I have grown for twenty rotations around the sun. My heart has beat in rhythmic cycles all the while. Small, rhythmic trembles, beating through age. Last night it rained a good amount. I awoke to the sound of the river raging into the sea, crashing against huge waves. A violent battle of fresh and salt-water forces. The river’s width increased dramatically since the night before, and the speed at which the water flowed was menacing. I stood in awe, trapped on the beach, merciful and powerless. This tremendous force blocked our only way back out of the valley. I looked out where the river met the ocean imagining sharks stationed with their mouths wide open, waiting for fish and other critters as they helplessly poured in from the rushing river. I looked back into the valley to see new waterfalls appear that weren’t visible before. 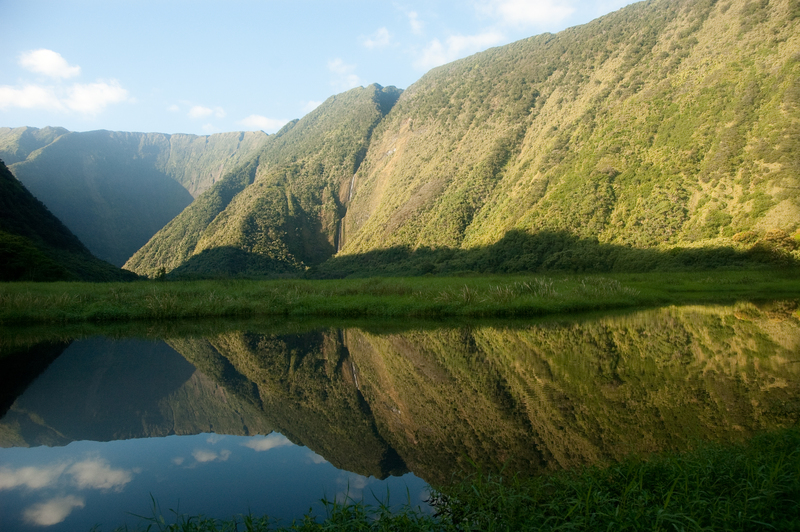 The amount of water coming down from the top of this valley, Waimanu, was unbelievable. How could it rain so much? It was a mesmerizing site watching new falls form slowly and subtly in the distance. This is the force that carved the valley into what it is now. A valley, which was used by Polynesians to nourish the growth of Taro, a staple food, which many subsisted off of and ensured food of plenty, even during terrible droughts and times of war and famine. It is a valley where people now come to live to get away from the modern human constructs of the world. It is a place of refuge, and serenity. It is a valley of time, ever-changing where all creatures may find food and stability. Yet it floods with tremendous volumes of water, carving, shaping, and changing the landscape. I look down at my feet, where the roots of my Hapu’u are buried deep into the ground, stable and grounded. I feel the whole earth shake and tremble, changing, as it should through age. In a few days, I will return home, far away from this chain of islands. I will remember how rooted I felt in the stories of Hawaii, like the carved belly-buttons, how stable and healthy I felt waking up each day with slow and purposeful intention. I will always remember how I grew and fell, grew and fell like the waves, and the Hapu’u tree ferns. I will remember how I changed, like the Waimanu valley, carving deeper and deeper into the wholeness of this earth. We all come from somewhere, and I have learned through my passage through Hawaii, that only when I stop and listen to the stories being told around me, may I find home.